YiiK: A Postmodern RPG Video Review – More Like Yikes! 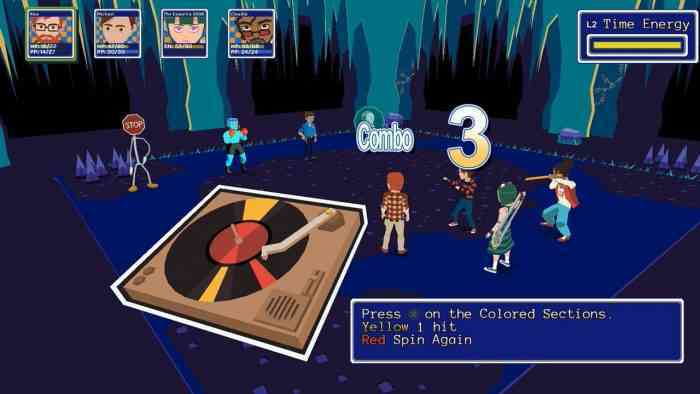 YiiK: A PostModern RPG is an indie game by Ackk Studios that’s designed to be a homage to Japanese RPGs as well as a fun exploration of a small-town mystery. The game is set in the ’90s- hence the punny title- and revolves around eight people who met through online message boards and are investigating the disappearance of viral video star. The characters, in their classically designed turn-based fighting, can use everyday weapons as items. Plus, the art is pretty stylistically gorgeous. Sounds like a recipe for a great game, right? Unfortunately, YiiK: A Postmodern RPG fell short of expectations. Instead of the fun exploration and story of a turn-based RPG, YiiK has too many problems to recommend and not enough of a silver lining to hold out hope. It’s the basic things that let Yiik down: it’s hard to play a game when you have to wait for everything (and that means everything) to load, not to mention the frustrating and tedious fights. YiiK dreamt big, but sadly, things just didn’t pan out. Have you played YiiK: A Postmodern RPG? If we’ve successfully persuaded you to forgo it, what game has disappointed you most in recent times? Let us know in the comments below!